I’ve been playing No Man’s Sky this week on PS4 and enjoying it. As an EVE player it doesn’t take long before your mind starts making comparisons between the two titles. 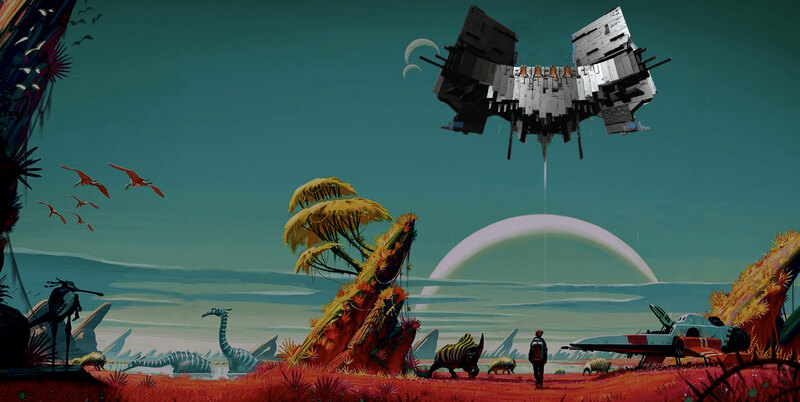 NMS is an exploration game primarily, but is set in a science-fiction universe and shares many of the same thematic foundations as EVE. The similarities are as different as night and day from that starting point. They are not even close to being the same game; two ends of a vast spectrum separate them. While EVE’s universe seems vast, it is nothing compared to the 18 quintillion procedurally-generated systems of No Man’s Sky. And while No Man’s Sky is a relaxing and often challenging game of exploration and discovery, what good is it without people to share it with? All of which got me thinking. As we stand on the edge of a new direction for EVE – a direction that might include player-built Stargates, new space, Nova combat inside of ships, and perhaps even on planets – are there lessons to be learned from No Man’s Sky? What can EVE take from the experience of playing NMS and translate into New Eden, if anything? You are all alone in No Man’s Sky. It is truly a single-player experience with some shared community data regarding discoveries and other information. But playing the game is a lonely experience. You are surrounded by life, by aliens, by NPCs that attack you, or warp into your field of vision, but the interaction with those elements of the game is extremely limited. The PvP, or what passes for it, is also extremely limited. Especially in the beginning. The game is “monitored” by Sentinels that are everywhere, keeping a watchful eye on your every move. Take too much, or cause too much trouble, and they will come down on you. A lot like CCP. (Just joking.) But there is no multiplayer aspect to the game. It is incredibly visual and a wonder to behold, but it is also very repetitive and often slightly annoying. It is also a weirdly relaxing experience in many ways. The normal pressures of game play don’t exert themselves the same way they do in other games; your goals are your own. The game itself demands very little of you. Sound familiar? In many strange ways No Man’s Sky and EVE share common traits. But they are also vastly different animals. And nothing will make you appreciate those differences more than playing ten or twelve hours of No Man’s Sky. I miss talking in chat. But mostly I miss the one fact about EVE that was most game-changing when I first realized it – the person on the other side of the screen. It is, after everything else, what makes EVE such a wonderful and challenging and rewarding experience. Interaction with real people. Defeating real people. Working together with real people. And exploring with real people. Of course, No Man’s Sky is not an MMO and it isn’t trying to be. It is a video game. A video game that proves beyond a doubt that people will respond to exploration challenges on their own merits. A fact that is often debated inside of the EVE community. No Man’s Sky can easily serve as a template for PvE inside of EVE. As long as that experience is rewarding, interesting, and engaging on its own merits, people will participate. It can be difficult for EVE to build those experiences within the confines of space on a consistent basis. And that is where repetition rears its ugly head. But I think No Man’s Sky can help expand on those thoughts, perhaps not directly, but by showing us that more can be accomplished than perhaps we have become accustomed to believing. And maybe, from a PvE perspective, that is an important lesson. Maybe we could all use some new ways of thinking about content. Soon we may need it. If we are to build our own stargates someday and explore new territory, then that needs to be considered carefully. In No Man’s Sky, every system is different and unique. But in that procedurally generated insanity, they all sorta kinda start to look the same. In my opinion it is a valuable warning that should be heeded when we consider new space in New Eden. Should it “be the same”? Or can we consider something new? Not just without local. Or with strange effects. But fundamentally different space. Space that demands attention from the players; space that perhaps requires an entirely new way of playing in it? Consider the possibilities for a moment. Will players bother building gates that simply take them to yet another system that looks just like the one they left? Will entire alliances conspire to work together to make a path to discover yet another New Caldari? They might not. But perhaps they would if that new space was truly something new. A place where things are truly different. If EVE survives not only its second decade, but moves on into its third, what sort of place should it be? It is an interesting concept to consider. If EVE survives not only its second decade, but moves on into its third, what sort of place should it be? Can EVE transform itself over time? Can it mold new dynamics, present new challenges, and warp itself slowly and surely into something almost unrecognizable to its founders? It is a mind-bending concept. If any game in history has the chance to do something like that, over such a long time, perhaps EVE is the one to do it. No Man’s Sky and EVE are distant, far-removed cousins. Cousins that grew up in different lands far from one another. But maybe No Man’s Sky can teach EVE a thing or two about thinking differently. And maybe EVE can teach No Man’s Sky a thing or two about opening up a little bit. As they both rocket into the future it should be interesting to see how they both evolve. As both EVE and No Man’s Sky would tell you, it isn’t the destination, it is all in the journey.